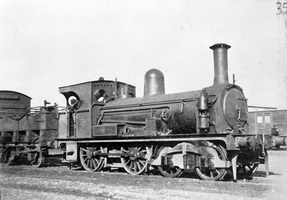 This is the second locomotive to have the O class classification (see O54 and O55 for first O class). t eventually gained the distinction of being the second class of locomotive known as the O class in the 1918-19 period. Service on the S.A.R. consisted mainly of shunting duties at Mile End and Port Adelaide, during which time it gained a Q class boiler during a rebuild at Islington. Driving Wheel Diameter: 4 ft. 6 in. - Diameter x stroke: 16½ in. x 24 in. Overall Length 29 ft. 4 in. "Robert Stephenson & Co" built 0-4-0 saddle tank type broad gauge steam locomotive.